Doesn’t it seem like everybody has at least one picky eater at home? It is a pretty pervasive problem for parents, but are all picky eaters the same? Surprisingly, no, not at all. See, picky eating is like a spectrum, we all fall somewhere on this spectrum, that has adventurous eating on one end and extremely picky eating on the other. But, there is a lot of gray in the middle. Those middle of the road picky eaters, tend to outgrow or move past picky eating with some consistent structure and routine at mealtime. But, the kiddo’s that fall at the far end of the eating spectrum, the really extreme picky eaters, they are in a category all their own. I wrote about this first a few years ago in, When Has Picky Eating Gone Too Far? I thought it was important to re-visit this again because I continue to see people lumping all picky eaters into the same boat. 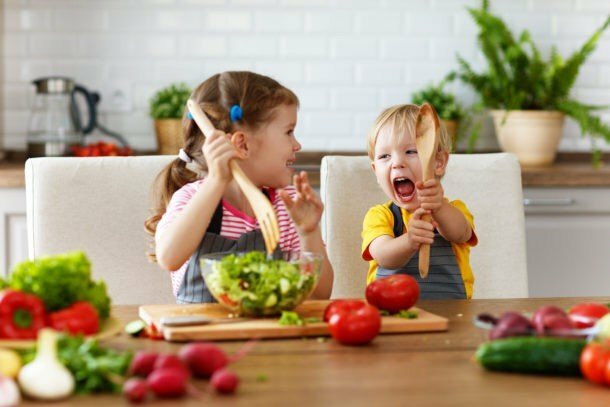 And, the distinction matters, if your child is an extreme picky eater versus an “average” picky eater because the extreme picky eaters often really struggle with food throughout their whole childhood and sometimes as adults. 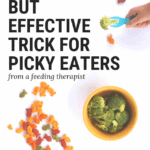 On top of that, extra and different strategies may be needed for the really severe picky eaters. Jeez, did I just overwhelm you??? 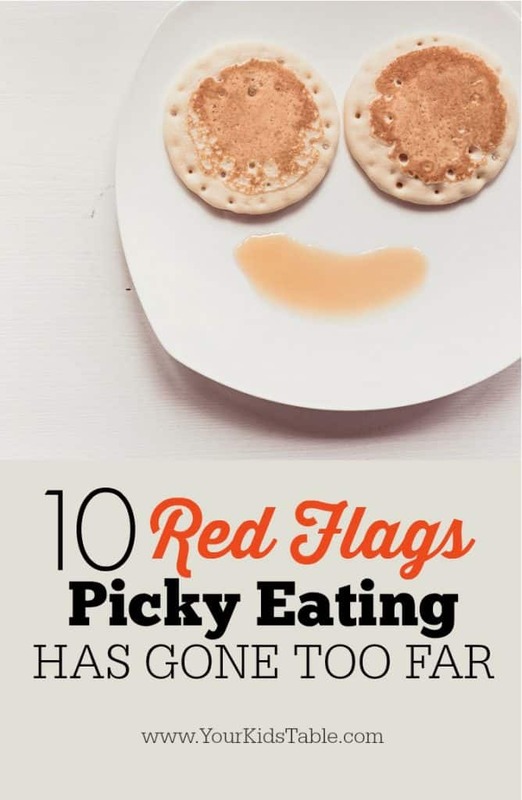 Don’t worry, I’ve got you covered, because I’m going to tell you exactly what extreme picky eating red flags you need to look for below. PLUS, I have an amazing and free opportunity for you to learn the 3 MOST IMPORTANT strategies you can use in YOUR home to actually turn picky eating around. And, guess what? These strategies are totally and absolutely necessary for average picky eaters AND extreme picky eaters, so no matter where your child falls on this extreme picky eating spectrum, you won’t want to miss the FREE and LIVE 1 hour workshop I’m going to be doing next week. That’s right, I’ll be live, teaching YOU how to overcome your child’s picky eating, and it is open to one and all! To get into the 3 Keys to Finally Turn Your Picky Eater Around workshop, sign up here and I’ll save your seat!!! Write down any questions you have for me because you’ll be able to ask me LIVE at the end of the workshop anything I might not have covered. 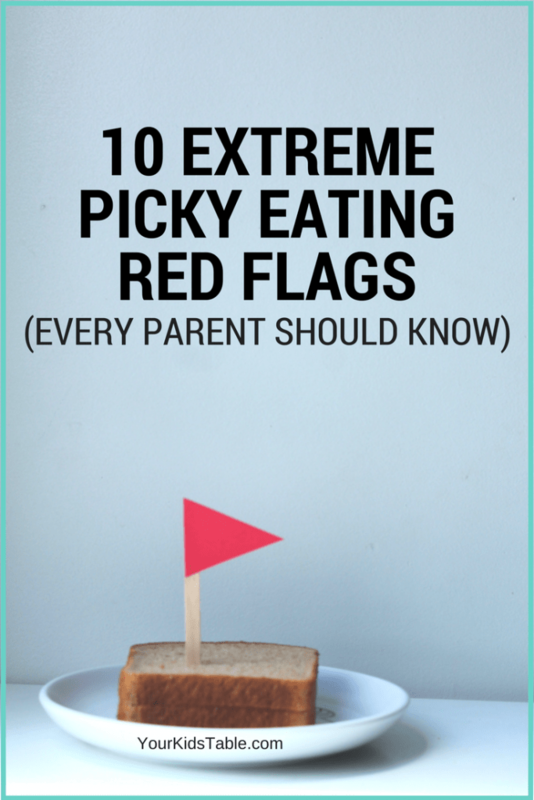 Go sign up and come back here to read about the 10 Red Flags, it will only take a minute! 1. Gags or even throws up at the sight, smell, touch, or taste of some foods. 2. Common picky eating strategies like the “just take a bite” rule don’t work. 3. Your child has meltdowns or major tantrums when they are encouraged to eat or interact with a new food or one they don’t typically eat. 4. Insists foods be prepared a certain way, and becomes very upset if the food is different from the way it is usually given to them (i.e. : will only certain brands, flavors, shapes, or colors.) This is actually a “thing,” and feeding therapists call it a food jag. 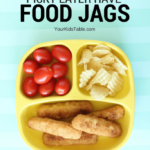 Head over to the guide for food jags to learn more. 5. You believe your child would actually starve or be hospitalized before they actually ate a new or different food. 6. Has less than 20 foods total in their diet, and sometimes even less than 5. 7. Is unable to eat the rest of what the family is eating at meals because their diet is so limited. 8. Will only eat when distracted by a tablet, the TV, toys, books, or even parents singing or telling stories. 9. Will only eat if they are physically fed by someone else and refuse to feed themselves, even though they are old enough and capable of feeding themselves. 10. Unable to eat foods in social settings like birthday parties and sleep-overs because they must have their food prepared in a certain way. This will cause anxiety in older children. Can Picky Eating Get Worse? Yes, it definitely can. 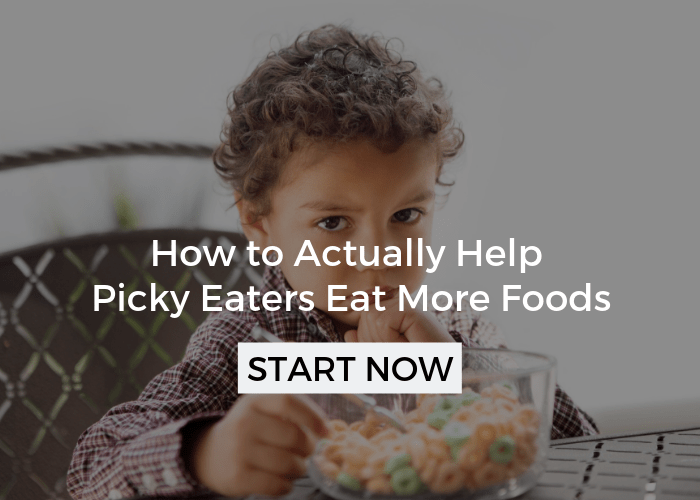 In fact, many extreme or severe picky eaters start off as “average picky eaters”, and because parents aren’t sure what to do (no judgement, its can be hard to find solutions), the problem can become worse and worse having a snowball effect. The good news is that in these instances, it can be prevented, but you need a plan. A great starting place is showing up for the free live 3 Keys to Turn Your Picky Eater Around Workshop because I’m going to go over my basic plan with you in person. You will learn so much more. Make sure you get a seat! SIGN UP FOR THE FREE PICKY EATING WORKSHOP HERE!!! I also want to mention that without those basic picky eating strategies in place, even extreme picky eating can get worse, even when you think it can’t. 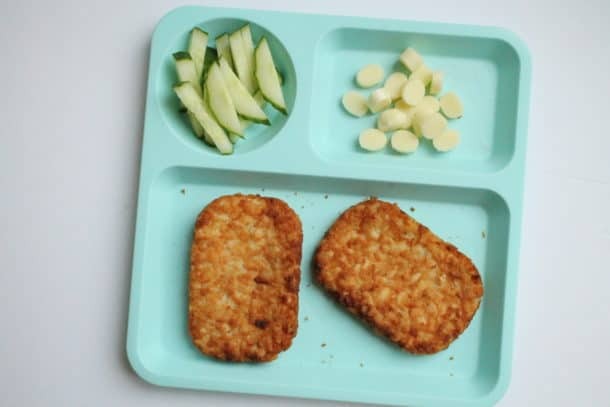 It’s very common for a child that has only 10 foods they eat to suddenly start to refuse one of their old tried and true favorites, to seemingly never eat it again. Of course, this isn’t all doom and gloom though because there is a way out of it, and I’ve seen dozens of kids do just that with the right strategies. You can do this for your child, too! It is possible, truly, as I know from personal experience, as well. Besides being a pediatric OT that specializes in feeding, I’m also a mom to three boys, one of which was an extreme picky eater. I totally get the struggle, stress, and pressure parents feel when their kid doesn’t eat. 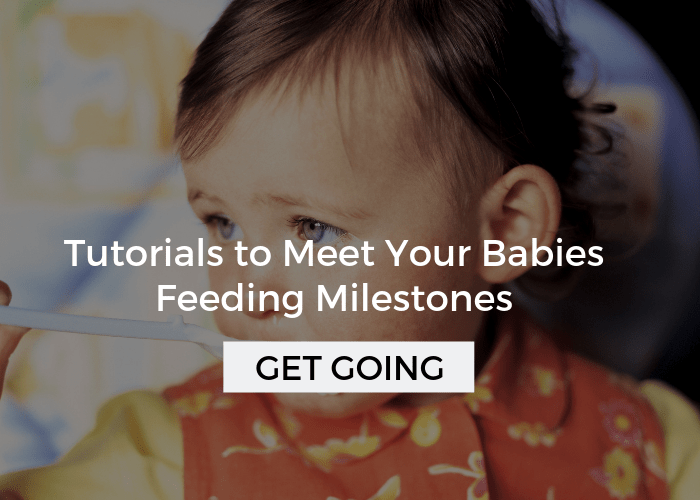 If you’re new here, and you’ve already signed up for the workshop, poke around in the menu bar and side bar to find lots more tips, tricks, and strategies for picky eating! 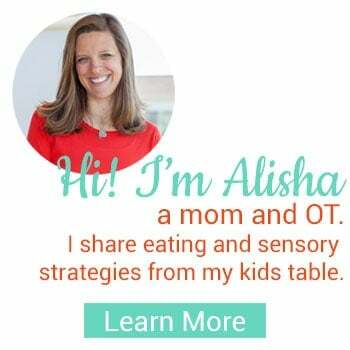 Hi Alisha – I just listened to your picky eater workshop. First – thank you for helping me realize I am not alone. Second – thank you for the permission to take away the personal blame. We have tried everything – rewards for trying new foods, rewards for eating new foods, dinner winner plates/treats, we currently have a jar to collect money (to go toward a family trip to the amusement park) for trying new foods, leading by example, we offer a preferred food, we went months where we took turns picking dinner (had to include a fruit/vegetable, protein, and starch), etc…. and nothing has worked. My boys are 7 and 5 and BOTH are extreme picky eaters with jags. We will start your 3 keys today, but likely will need to pursue feeding therapy. I am so tired. They eat no meat, no vegetables, one son eats no fruit… anyways – I will comment back if the 3 keys reduce stress. They are healthy and very tall for their ages, but that doesn’t take away from the need to eat more foods. Food has too much power in our lives and I worry what this does for their nutritional health and their future relationship with food. I will consider the mealtime works class/package. Thank you for your support. Hey Jessie, you’re so welcome! I’ll say that often the biggest and quickest result is no stress at meals. It sounds like there may be some underlying issues going on. And, what you learned is the workshop is definitely where you should start! But, learning how to get to the root of the problem, is a huge game changer for extreme picky eaters. Plus, you’ve got access to me on the discussion board whenever you need personal guidance:) Know that I totally get where you are, there really are so many others out there in the same spot as you! If you have any questions about Mealtime Works don’t hesitate to let us know! My oldest child was quite a picky eater. Our second child was worse, -much much worse. 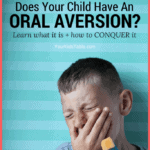 It turned out that he is hyposensitive in his mouth and also has oral apraxia. He couldn’t feel the food properly, and if we did manage to get something in his mouth and he didn’t immediately start gagging, he had no clue what to do with it. We managed to get him at an excellent feedingtherapist and things are going much better and I can actually implement some of your recipe ideas. My son truly doesn’t eat. He doesn’t even eat junk food. We have supper at the same time every night. Our routine rarely changes. I’ve done OT therapy and they say they can’t help. He knows how to eat but refuses. My son can go days without eating and the only thing he gets is a pediasure. Nobody understands. He is a very underweight 6 year old. Can anybody help!!! My friend’s 6 year old child had always gagged at most foods and not eat. A new pediatrician immediately saw that her tonsils were so large that she could barely swallow food. After removing them, she is better but doesn’t eat much out of habit. Try cutting out all milk and dairy products. It took so long for us to realize the reason my oldest would only take pediasure was because he’s actually lactose intolerant! He was 5 when we stopped giving those and no cheese or butter or anything containing milk (unless it’s only the whey then it’s usually okay for him) and he finally started eating and growing again. It’s so rare for a you g child to be lactose intolerant that most people don’t even think to consider it. Best of luck to you!! Hi Jen, this is really hard. At her age I would do a few things. 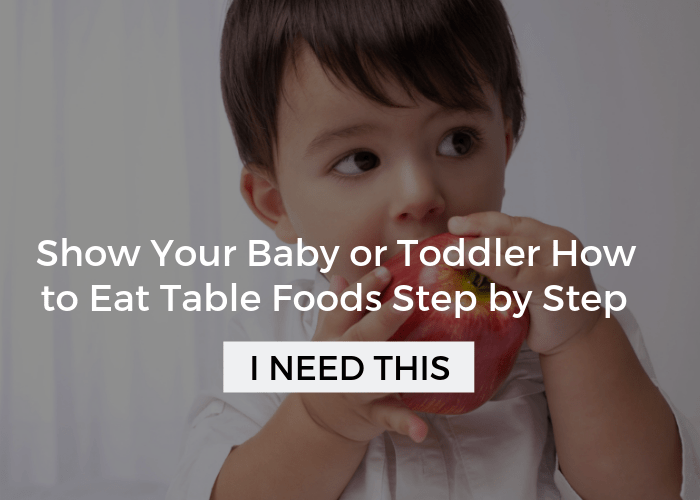 First is check out how to transition to table foods! This will be really helpful, patiently follow the steps. Also, take a look at sensory aversions with food. 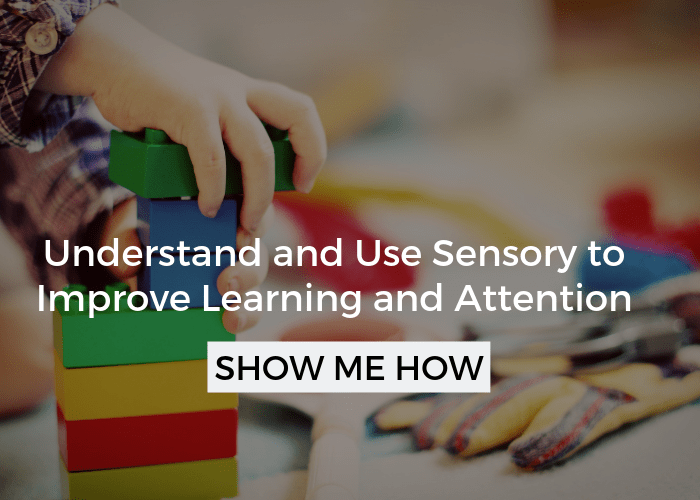 I’d get her started with sensory bins and messy play– I know sounds weird, but it really helps desensitize them to textures. Hi, My daughter’s name is also Alisha and she has Asperger’s and all the characteristics you mentioned about food, she has them. I worry about her intake of vegetables. She has no problems whatsoever, eating cakes, chocolate, chips, certain biscuits or pastries. But when it comes to regular food or vegetables it is tough to introduce food to her. She might as well starve than eat a new food. She is strongly averse to smell of spices. I also have this post on helping kids eat veggies. I have an 18 month old that has been picky since we started baby food when he was 6 months. He’d gag on everything. That stopped about 14 months but now he will only eat a certain brand of yogurt, chips, bread, and sometimes Apple sauce mixed with baby food veggie and a dab of baby food turkey. He’s been delayed in his development and we’ve taken him to a developmental specialist. He receives therapy for the delay and he’s almost where he should be physically. She didn’t seem concerned about his eating habits and our family doctor hasn’t been either. But I am…im did worried and frustrated. Any tips on this age? It sounds just like my child! Same age and everything. We should really talk. Another option would be to look into feeding therapy. Take a look at those resources and let me know if you have more questions! I have a grandson who is 5 years old and will not eat. His Mother is now setting with him for an hour to encourage him with every bit till his food is gone. She found he is not eating at preschool and is worried about him starting kindergarten. His twin brother eats everything. What can we do? Did any of the reasons above stand out to you or her? If so, I’d explore the strategies I suggested, getting to the bottom of their underlying issue can really make a huge difference. I’d also make sure mealtimes are regularly scheduled, no snacking, and I’d actually not pressure him to eat but make sure he has one preferred food at each meal. If he doesn’t eat it, that’s on him! I know that sounds hard, but setting up these routines and structure is really helpful! I have a free workshop about these and other strategies, if you’d like to learn more! Sign up here. My “in 2 weeks” 2 year old rarely eats dinner, and has the same thing for breakfast every day. Lunch is a hit and miss, but snack time is usually when she eats the most. It’s usually berries, grapes, or some sort of fruit. Loves yogurt. Won’t eat potatoes, but she likes rice. Meat of any kind is a struggle and we were even putting it in her yogurt for a long time so she’d get some protein until she caught on. Meal times are beyond frustrating and it seems as though she has no problem eating the “garbage” foods. Hey Rachelle, I know its exhausting! See the above comment, I think it will be helpful! My 10-year-old grandson eats fewer than a half dozen foods, although he will eat a large variety of sweets and junk food such as Cheetos or chips (which his father and we limit). He will eat only specific kinds of foods, for example one brand of plain pizza, one flavor of Goldfish, one brand and shape of easy mac and cheese. Even with sweets, he restricts his eating, for example he will eat only vanilla ice cream. He finds the smell of citrus very aversive. He’s had some difficult experiences, so there is likely a psychological aspect to his food issues, but he’s a sociable, cheerful and bright boy who doesn’t have learning differences or other special needs. He has been a picky eater since he was a toddler, but over the past couple of years has become extreme. Do you have any advice or suggestions? Your grandson is not alone at all! There are so many kids in similar situations. One of the best resources I can point you to is 5 reasons kids don’t eat. I’d take a close look at that and see if anything rings a bell. I also have a plan listed in there with some steps to follow, since, depending on the cause the strategies may be different. After you look at that, let me know if you have more questions! My 3 year old granddaughter was a micropreemie and has weighed only 25 pounds for months. She does not want to eat! It is beyond frustrating for her parents. She nurses occasionally and her mother rarely cooks healthy meals. She usually offers her junk food like pizza or fries. How can we help? This post will also be VERY helpful.